This year marks 26 years since the establishment of diplomatic relations between China and Azerbaijan. The relations between the two countries have reached a high level, in particular in the field of economy and trade. 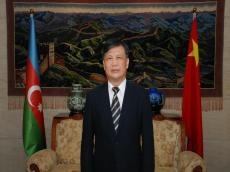 Chinese Ambassador to Azerbaijan Wei Jinghua spoke about the distance covered by the countries during this time, new tasks, prospects and plans for the future in an interview with Trend. How do you assess the potential of economic and trade cooperation between Azerbaijan and China? In the 26 years since the establishment of diplomatic relations, cooperation between China and Azerbaijan in the economic and trade spheres has grown significantly and has become a driving force for the development of bilateral relations. This cooperation is constantly developing. While in 1992 the bilateral trade turnover amounted to $1.5 million, in 2017 this figure, having increased more than 800 times, reached $1.298 billion. Despite the slowdown in the global economy, the volume of trade between Azerbaijan and China reached a record level in 2017. In the first half of this year, China became one of the seven major trading partners of Azerbaijan and the third largest importer of products to the country. Cooperation between the two countries is developing in particular in such areas as transport, communications, agriculture, construction, engineering and light industry. The structure of trade turnover is becoming more diversified. This fully demonstrates that business cooperation between China and Azerbaijan is very mutually beneficial and has great potential. What is the potential for mutual investment growth today? The 40th anniversary of China's reform and opening-up policy is celebrated in 2018. During this period, great changes occurred in the country. Experience was accumulated in the field of economic liberalization, optimization of the investment sphere, construction of industrial, scientific and technical parks. The Azerbaijani government continues to carry out economic reforms, constantly improves the investment sphere. Chinese enterprises are ready to participate in the economic construction of Azerbaijan. The Chinese side also welcomes the investments of Azerbaijani companies in China and the development of mutually beneficial cooperation in the fields of oil and gas, infrastructure, ICT, alternative energy, tourism, equipment production, creation of free trade zones, construction of industrial and agricultural parks. I am confident that as far as the investment climate in Azerbaijan develops, more Chinese companies will arrive in the country for carrying out investment activity and setting up enterprises. In general, more than 20 Chinese enterprises are engaged currently in entrepreneurial activity in Azerbaijan in various fields. I would also like to note that there is a growing interest of foreign entrepreneurs in investing in China, especially in the spheres of high-tech industry and services. China, in turn, will continue to create more attractive investment conditions, significantly expand access to its market, increase intellectual property protection, and actively increase imports to create a more attractive and balanced environment for entrepreneurs from Azerbaijan and around the world. I am sure that the efforts of both sides will lead to an increase in the level of mutual investment between the two countries. What are the opportunities for the implementation of joint Azerbaijani-Chinese projects in third countries? In 2015, Chinese government initiated a new model of "international cooperation in the market of third countries" that effectively connects China's manufacturing capacity, advanced technologies of developed countries and the needs of developing countries. This cooperation model has received positive responses in the international arena over the past 2 year, demonstrated a positive development trend, and has become an important part of the "One belt, One road" initiative. That is, the Chinese side encourages and supports any international cooperation in the market of a third country, conducted on the basis of compliance with the principles of business, allowing to achieve mutual benefit, openness and tolerance, the development of friendly relations between states and raising living standards. How do you assess the role of Azerbaijan in the implementation of the "One belt, One road" initiative? Azerbaijan is an important country situated along the "Silk Road" and actively supporting and participating in the initiative of joint construction of "One belt, One road". In April 2015, Azerbaijan became a founding country of the Asian Infrastructure Investment Bank, and in July - a dialogue partner of the Shanghai Cooperation Organization. In December 2015, during the visit of President Ilham Aliyev to China, the two sides signed a Memorandum of understanding on the joint construction of the Silk Road economic belt. The document gave a new impetus to the further development of the Chinese-Azerbaijani economic and trade relations. The Caspian sea is an important trade channel connecting the Eurasian continent. China welcomes and highly appreciates the efforts of the Azerbaijani side to promote the construction of transport infrastructure and the implementation of projects that promote interconnection. Beijing is ready to deepen the comprehensive Chinese-Azerbaijani cooperation within the framework of the "One belt, One road" initiative, and to make a proper contribution to the development of countries situated along the "Silk Road". How do the existing high-level contacts influence the level of development of bilateral economic relations? This year is marked by its importance in the history of Chinese-Azerbaijani relations. In February, Minister of Economy of Azerbaijan Shahin Mustafayev paid an official visit to China. During the visit he took part in the opening ceremony of the office of the Trade Representation of Azerbaijan in China, attended the conference on the role of the Trans-Caspian international transport route in the "One belt, One road" project, the Chinese-Azerbaijani business forum, presentations dedicated to investment climate of Azerbaijan and held meetings with the Minister of Transport of the PRC Li Xiaopeng and the International Trade Representative and Vice-Minister of Commerce of China Fu Ziying. In April and June, Azerbaijani Defense Minister Zakir Hasanov and Chairman of the Parliament of Azerbaijan Oktay Asadov visited China. Close high-level ties testify to the high level of political trust between our countries. We will continue this active trend, continuously expand and deepen contacts at a high level. As you know, the Azerbaijani delegation is expected to participate in the Chinese-Eurasian exhibition, which will be held in Urumqi in August this year. By the end of this year, the wine house of Azerbaijan will be opened in Shanghai. Trade and wine houses are planned to be opened in other major cities. It is worth noting that in November the first Chinese international import exhibition will be held in Shanghai, which is projected to attract about 150 buyers from more than 100 countries. The Azerbaijani delegation will also take part in this grand event. We are sure that with the help of this exhibition your products will gain popularity among Chinese consumers. The Chinese side is ready to provide the necessary assistance to bring trade and economic relations between our countries to a higher level. Does China expect the growth of bilateral trade with Azerbaijan at the end of this year? According to data for 1H2018, China ranks seventh in the list of trading partners, and third in imports. In general, China accounts for 3.81 percent of Azerbaijan's total trade turnover. In the structure of trade turnover, the main volume fell on various machines and mechanisms, electrical equipment and spare parts, fossil fuels, plastics and products made of them, clothing, rubber and so on. China provides Azerbaijan with a large market for exports, which gives a new impetus to the increase in trade turnover between our countries. I am confident that this figure will increase in 2018 with our joint efforts. What are the current trends in the Chinese economy? In the first half of this year, China's economy remained stable. The upward trends are observed, the structural reorganization is carried out intensively. New driving forces are constantly replacing the old ones, the quality and efficiency are steadily improving, China's economy has good inclinations to reach a higher quality development level. From January to June, GDP increased by 6.8 percent and remained in the range of 6.7 - 6.9 percent. The World Bank, the International Monetary Fund, the Organization for Economic Cooperation and Development and other international organizations positively assess the success of China's reforms and development, which is reflected in the forecasts for China's economic growth. China's economy has great potential in the long term. Reforms and openness continuously give new impulses. China's economy will continue its trend to continuous improvement. In general, Beijing has always advocated free trade, and will work with the international community to defend the process of multilateralism, the system of global free trade and the principles of the World Trade Organization. Reforms and openness are China's national policy, the doors to China will never be closed.